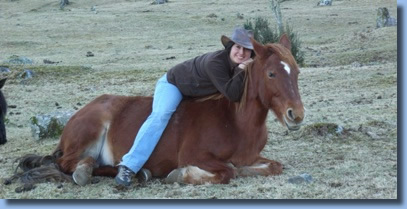 For those who have not ridden much (or ever), or those who mostly ride dressage and would like to learn about trail riding, we offer a four-day get-to-know riding program. 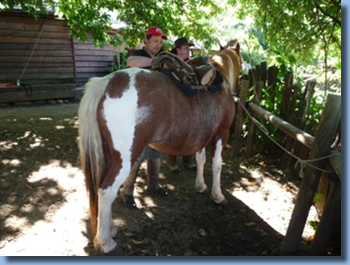 We learn about basic horse care, including grooming and cleaning the hooves, and then learn the handling of the bridle and saddle. 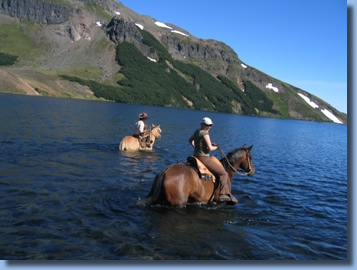 We will teach you the Chilean way of horse riding, which is ideal for riders who plan to be on horseback for long periods of time or travel long distances. 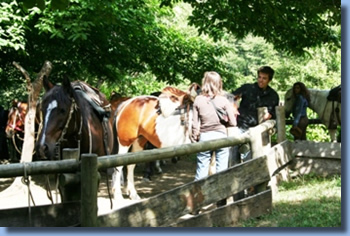 After this introduction, we have several horseback tours to choose from. will be spent on the farm. You arrive at 1pm, we welcome you, show you around and bring you to your room where you can store away your things. Later on we start the program with some easy exercises and basic riding gymnastics designed to teach you how to balance. We continue training with the horses in the pasture to learn the horses' many gaits: walk, trot, canter and gallop. Sleep in in the morning then stroll around the farm and pastures, or take a walk up the mountain enjoying the great views out over the volcanoes. 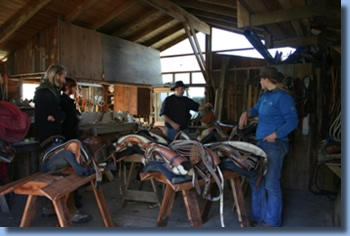 Around midday we'll go get the horses and you'll learn how to prepare and saddle your horse under observation your guide and trainer. 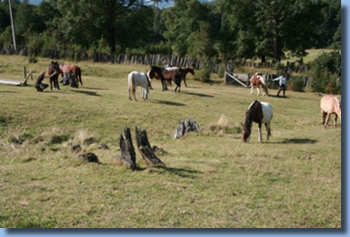 Then we'll leave for a 3-4 hour ride through the Mapuche Indian community Quelhue, and practice what we've learned so far out in the fields. 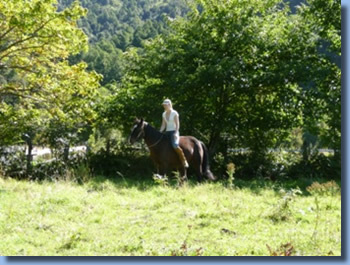 We pass by the Mapuche settlement, cross a little creek and have a nice canter or gallop on the banks of Trancura River. 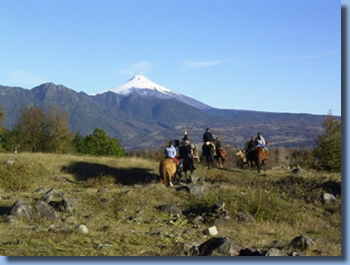 Today we take off for a two-day ride to the "Cerros de Quelhue" Forest Reserve, the protected area which borders the farm. Again passing by the Mapuche settlement, we ride up into the mountains until we reach a abandoned farm in the rainforest were we build our camp for the night right between the grazing horses. 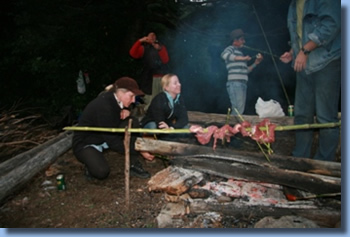 We prepare a typical Chilean "asado al palo" in which the meat is barbecued on long bamboo sticks. Early in the morning we'll light the fire again and prepare hot coffee for you for breakfast. After we've eaten we'll take bridles and lassos and go round up the horses. After cleaning and saddling, a job that by now everyone will be able to do on their own, we'll be on our way, riding between huge Mañio and Coighue trees, leaving the mountains behind and heading back to the farm. In the evening we'll drive you down to town, although you may of course feel free to stay longer if you want. 2 nights in double in guest-house on the farm, 1 night in tent camp. In the tent camp 2 riders share one tent. on day 3 the camp is beside a clear mountain lake. Complete food and soft drinks from dinner on the first day to the breakfast and snack on the last day. 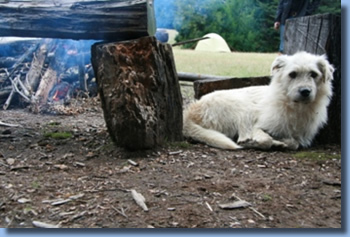 On the trail we have breakfast, a snack at midday and dinner at the campfire. 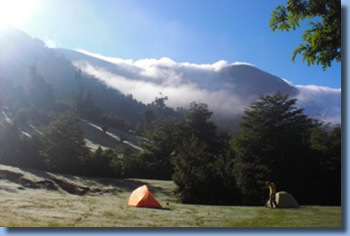 All transports to and from Pucón, all fees, all equipment from spoon to tent and sleeping mats. Discount for bringing your own sleeping bag.